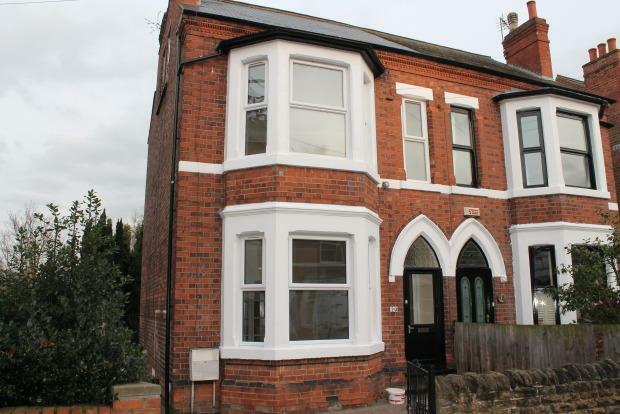 4 Bedroom To Rent in Nottingham for £975 per Calendar Month. This is an exceptionally spacious property, newly decorated to an exceptional standard throughout whilst embracing its original character. This large house is set over three floors and has been decorated to a great standard and the period features brings the home a great feel. Externally; Driveway parking for up to three cars to the front and to the rear there is a patio area, large enclosed garden with decking, a shed and outhouse with electric supply. Entrance; A large entrance hallway with new carpet flooring and entrance to the stairs to the first floor. Living room/Dining Room; A bright and spacious room with a modern feature fireplace and cream carpet. The dining/living room is separated with a partitioned wall and can be opened to create a larger open plan space. Kitchen; This modern fitted kitchen comes with a fitted gas oven and hob. Family bathroom; Recently refurbished with matching three with a shower over the bath. Bedrooms; One single bedroom and an exceptionally large master bedroom to the front of the property. Bedrooms; A further two large double bedrooms. The property also benefits from a basement and large rear garden. Unfortunately no sharers/pets will be considered for this property. Call today to view on 01159 620961.